Ex Norrona I, Norrona, Gustav Vasa. Steel twin screw motor vessel built in 1973 by Werft Nobiskrug Rendsburg Germany (Yard No 678) as a Passenger/RoRo Cargo/Ferry. May 12th 1973: Delivered to Lion Ferry Ab, Halmstad. 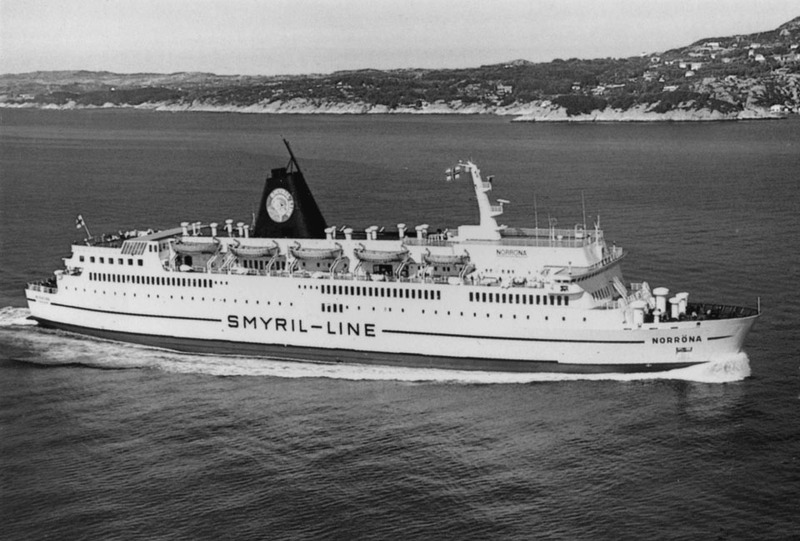 May 12th 1973: Chartered to Svenska Rederi Ab Öresund, Malmö for Öresundsbolaget routes between Malmö – Travemünde. 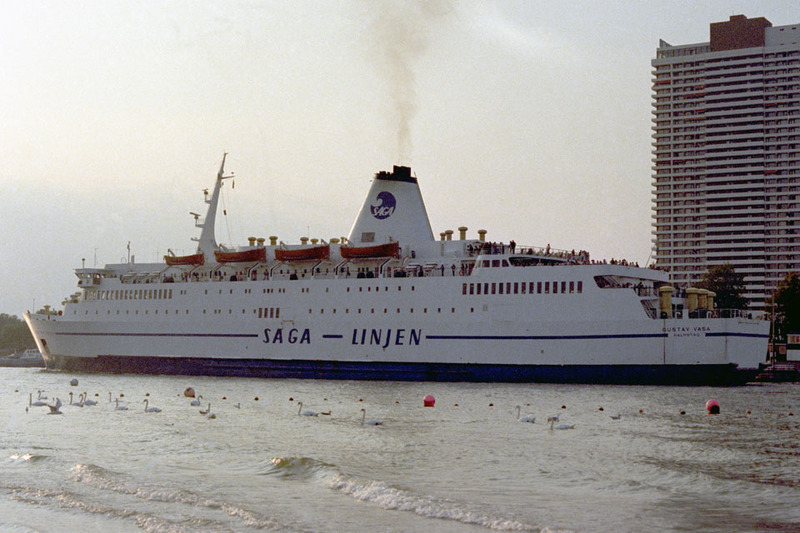 October 12th 1976: Öresundsbolaget and Trave Line join forces and are marketed under the name Saga Linjen for services between Helsingborg/Malmö – Travemünde. 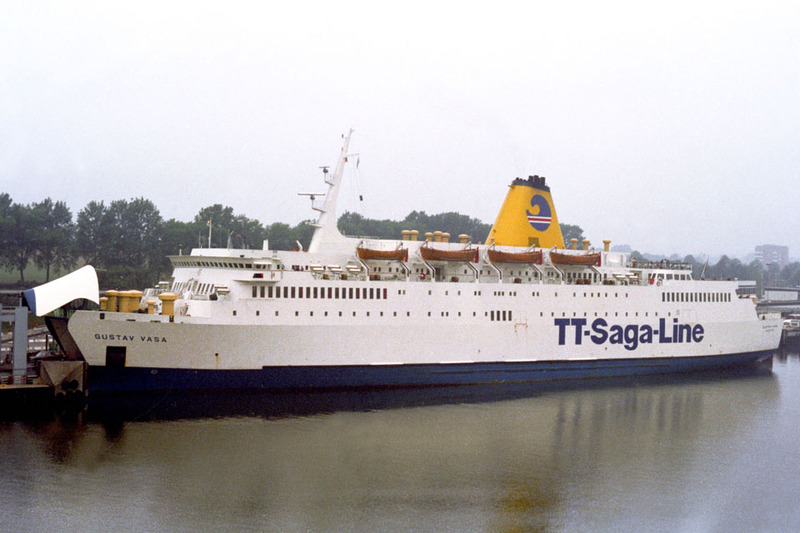 1980: Saga Linjen and TT-Line join forces under the new name TT Saga Line. Commenced services between Malmö – Travemünde. 1982: Supplemented summer sailing between Travemünde – Rönne. January 17th 1983: Commenced services between Trelleborg – Travemünde. 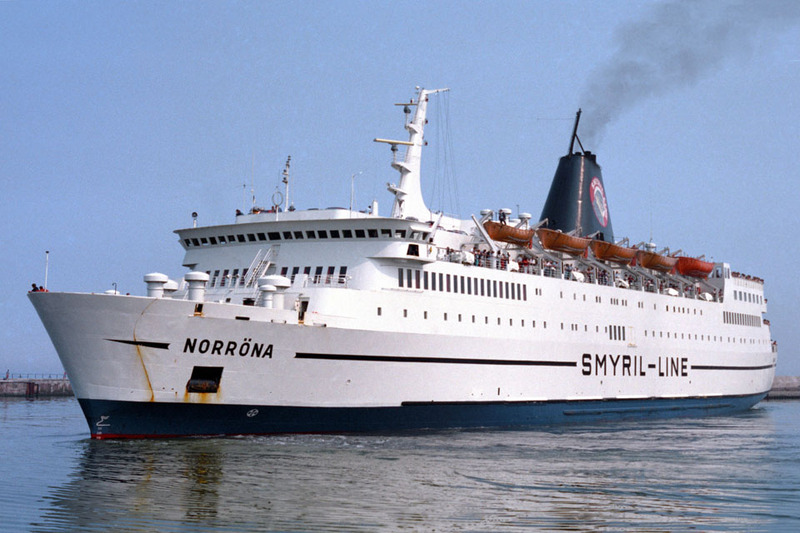 April 1st 1983: Sold to Smyril Line, Torshavn, Faroe Islands and renamed NORRÖNA. April 1983: Rebuilt at Flensburger Schiffbaugesellschaft, Flensburg more cabins as well as having stabilisers fitted. June 6th 1983 – September 18th 1983: Services between Torshavn – Lerwick – Bergen – Hanstholm – Seydisfjördur. 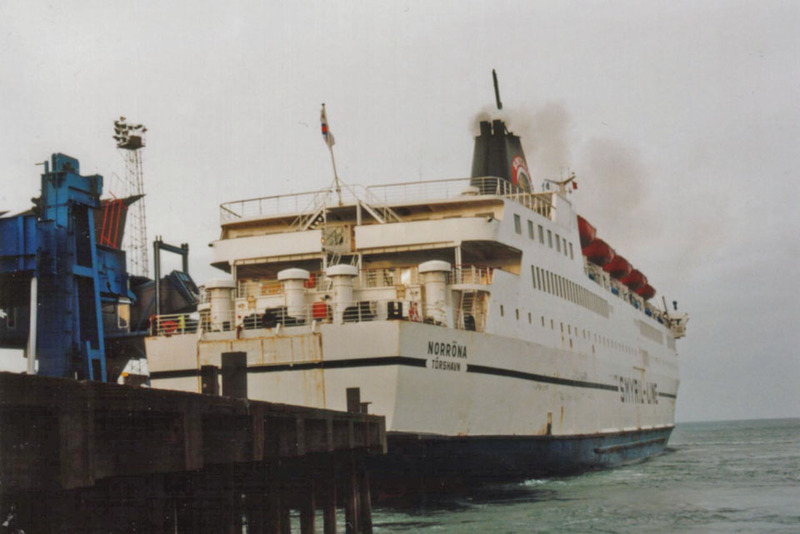 October 14th 1983 – March 31st 1984: Services between Kiel – Korsör. 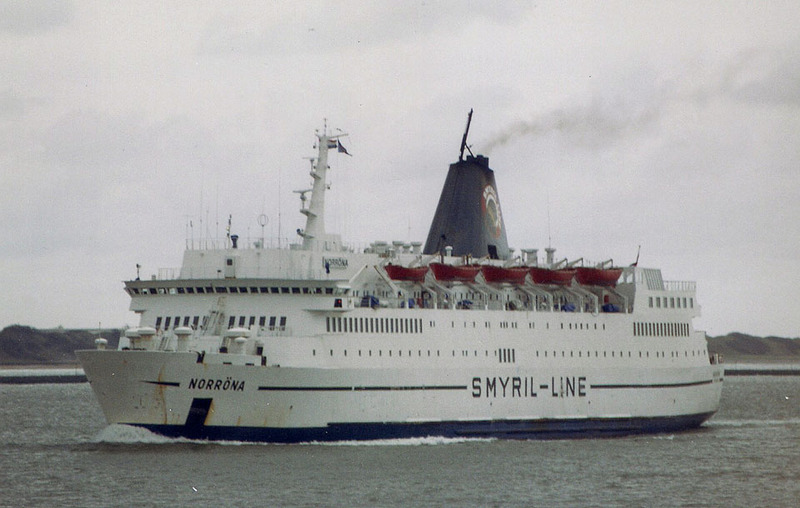 May 1984 – September 17th 1984: Services between Torshavn – Lerwick – Bergen – Hanstholm – Seydisfjördur. September 19th 1984 – May 7th 1985: Chartered to TT-Line GmbH & Co, Hamburg for services between Travemünde – Trelleborg. 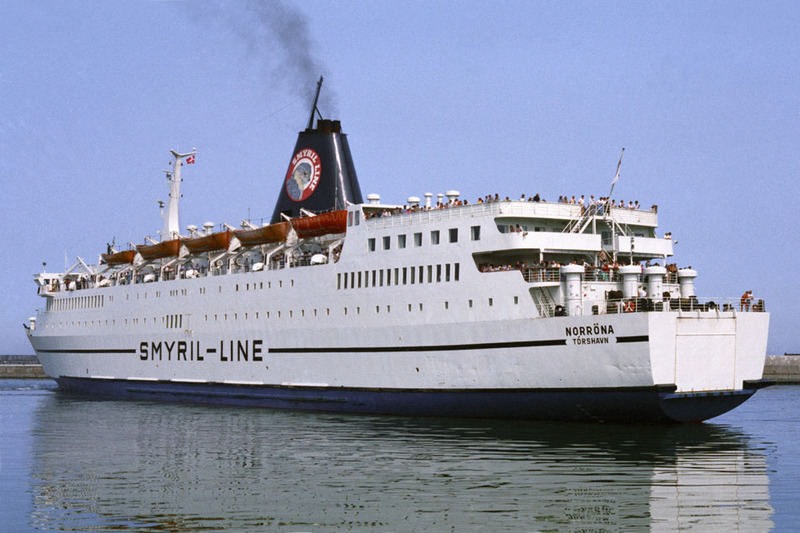 May 7th 1985 – September 1985: Services between Torshavn – Lerwick – Bergen – Hanstholm – Seydisfjördur. September 1985 – April 1986: Laid up in Copenhagen. April 27th 1986 – June 2nd 1986: Chartered to TT-Line GmbH & Co, Hamburg for services between Travemünde – Trelleborg. 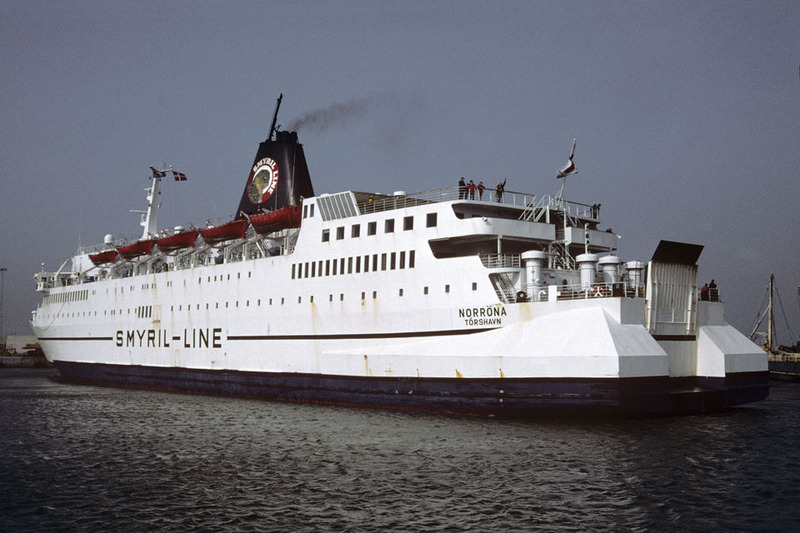 June 1986 – September 1986: Services between Torshavn – Lerwick – Bergen – Hanstholm – Seydisfjördur. September 1986 – May 1987: Laid up in Copenhagen. 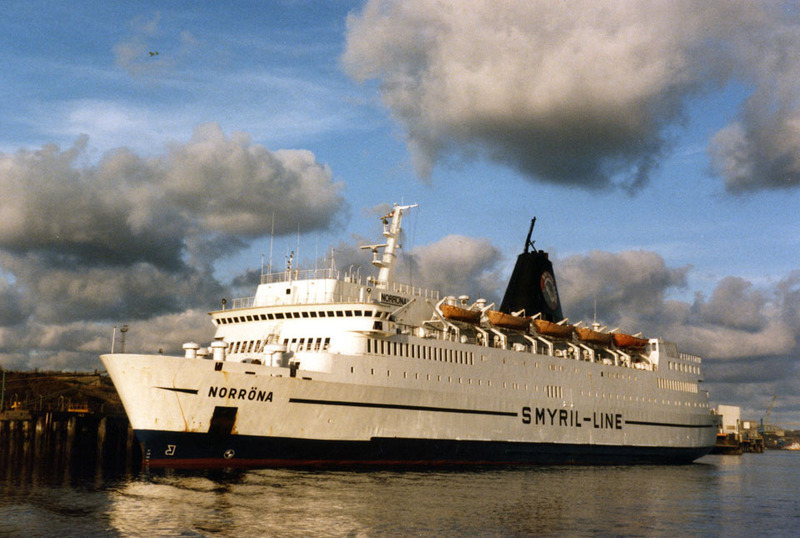 May 1987 – September 1987: Services between Torshavn – Lerwick – Bergen – Hanstholm – Seydisfjördur. 1987: Mini cruise from Wilhelmshaven to Southampton calling at Dover to give the passengers a day ashore. 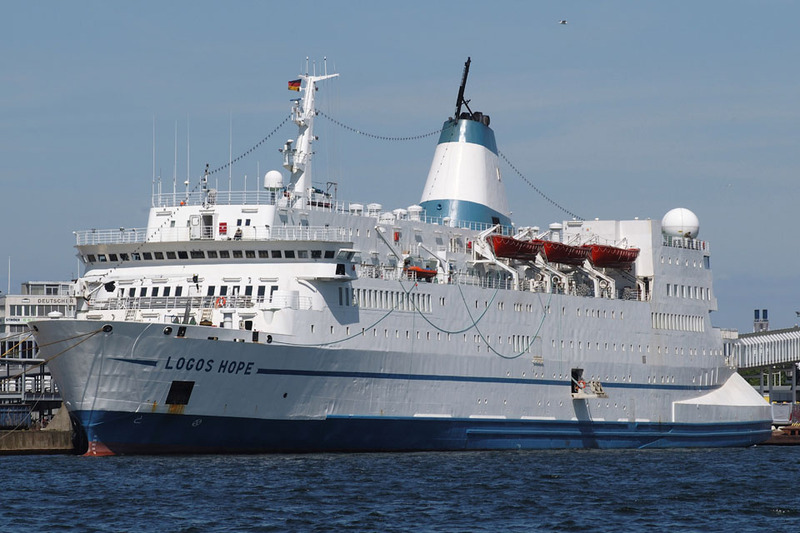 She became to first cruise ship to berth at (the new) Pier D.
May 1988: Chartered to Thematik Reisen GmbH, Hamburg for cruises between Hamburg – Klaipeda. 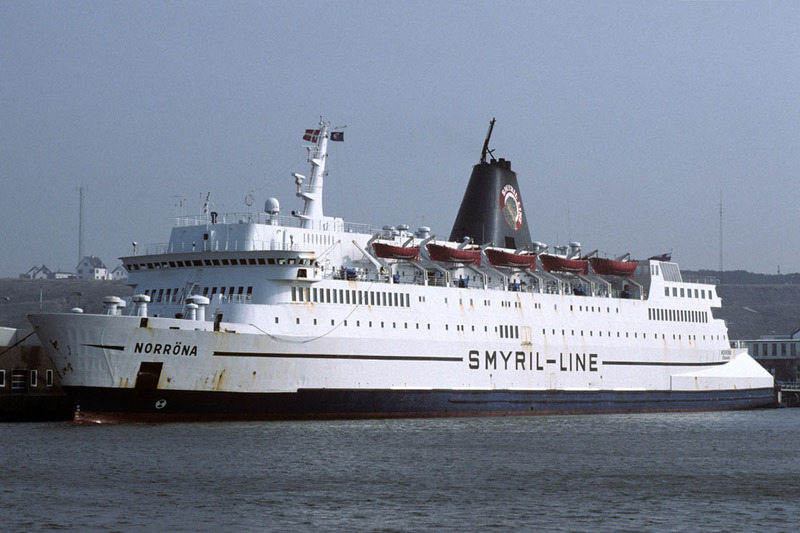 May 1988 – August 1988: Services between Torshavn – Lerwick – Bergen – Hanstholm – Seydisfjördur. 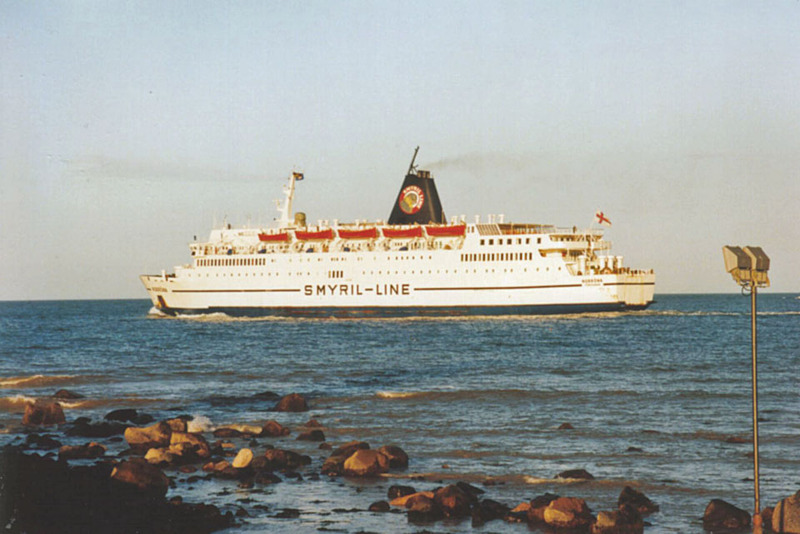 August 31st 1988 – October 29th 1988: Chartered to Larvik Line, Larvik for services between Larvik – Frederikshavn. November 7th 1988 – November 28th 1988: Chartered to GT-Link for services between Gedser – Travemünde. November 30th 1988 – April 1989: Laid up after inspection/refit at Flensburger Schiffbaugesellschaft, Flensburg. April 1989 – August 1989: Services between Torshavn – Lerwick – Bergen – Hanstholm – Seydisfjördur. 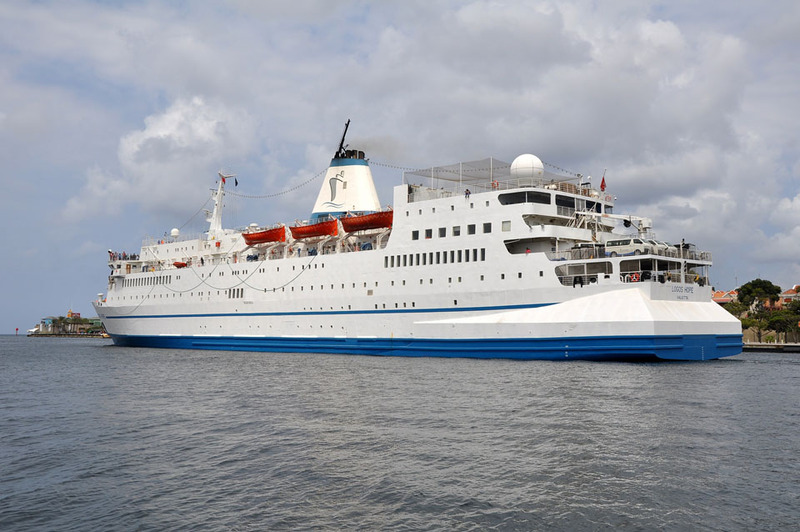 September 4th 1989 – September 29th 1989: Chartered to Thematik Reisen GmbH, Hamburg for cruises From Hamburg around the UK/Kiel /Travemünde to the Baltic Sea. 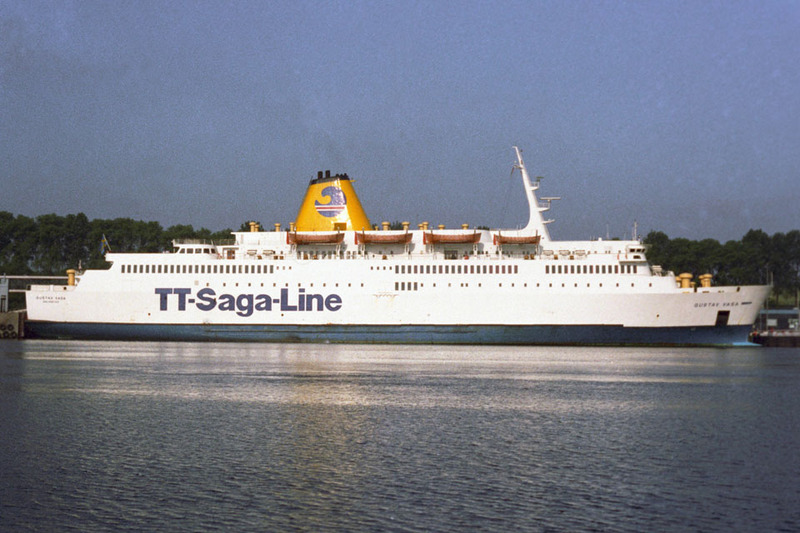 October 11th 1989 – April 1990: Chartered to B&I Line Plc, Dublin, Ireland for services between Pembroke – Rosslare. April 9th 1990: On a trip to Rosslare she suffered a fire in unused cabins beneath the car-deck. One crew member was killed. Taken out of service for repairs. April 12th 1990: Returned to service. 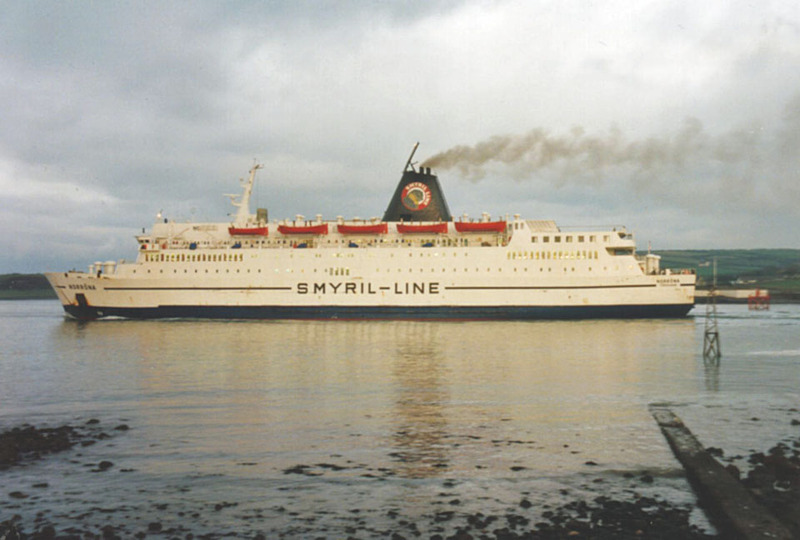 May 1990 – September 1990: Services between Torshavn – Lerwick – Bergen – Hanstholm – Seydisfjördur. October 1990: Chartered to RiNo Lines, Norrköping for fourteen days for services between Norrköping – Helsinki (Mondays – Thursdays) Norrköping – Riga (at weekends). Then laid up in Ålborg. October 1990: Chartered to British Ministry of Defense for one trip between Harwich – Narvik. 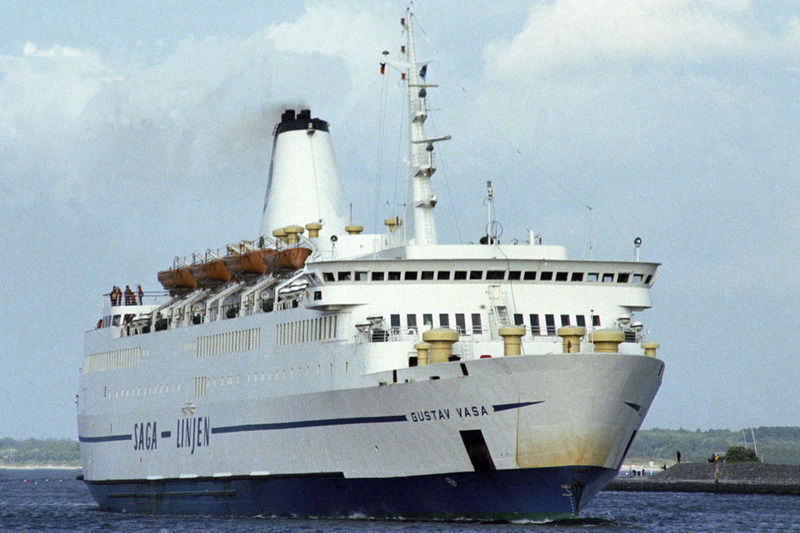 November 1990 – January 3rd 1991: Chartered to Baltic Line fore services between Gdynia – Karlskrona. January 1991 – April 1991: Laid up in Copenhagen. 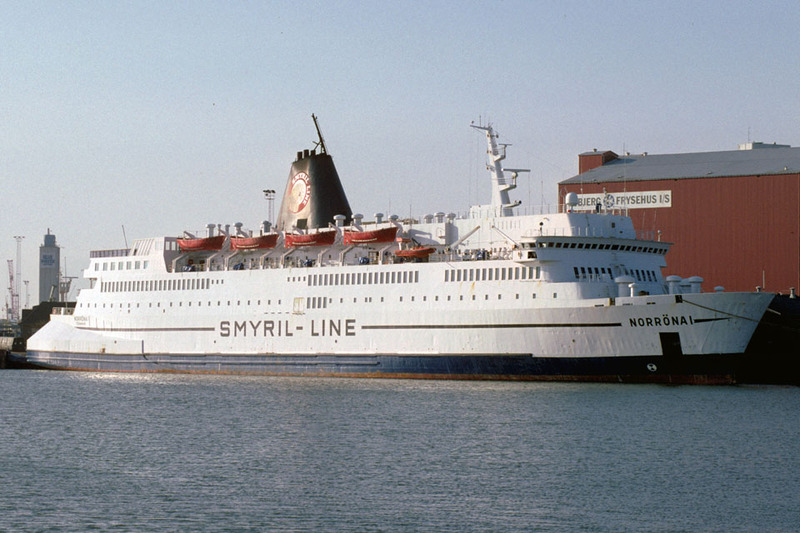 May 1991 – September 1991: Services between Torshavn – Lerwick – Bergen – Hanstholm – Seydisfjördur. September 1991 – May 1992: Laid up in Copenhagen. 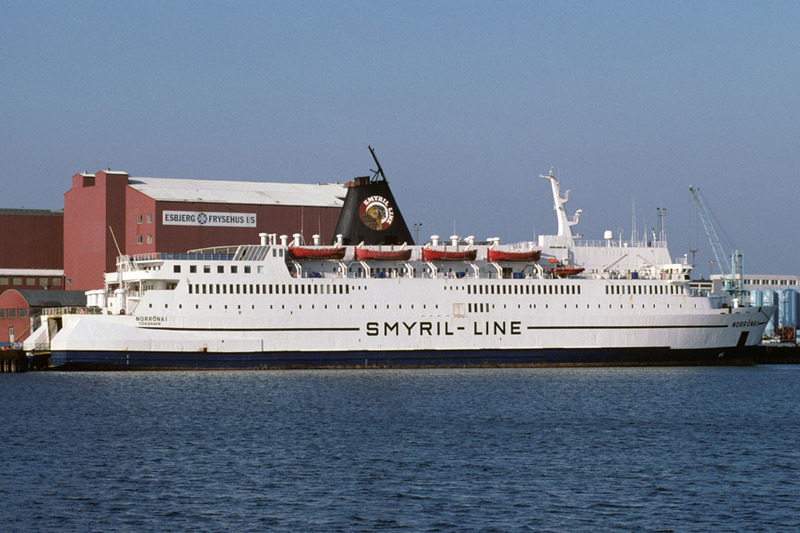 May 1992 – September 1992: Services between Torshavn – Lerwick – Bergen – Hanstholm – Seydisfjördur. September 1992 – May 1993: Laid up in Copenhagen. 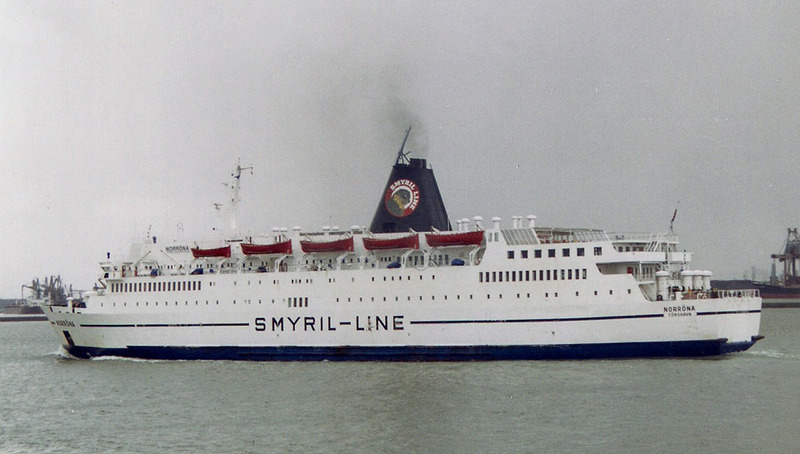 May 29th 1993 – September 1993: Services between Seydisfjördur – Bergen – Torshavn – Esbjerg. 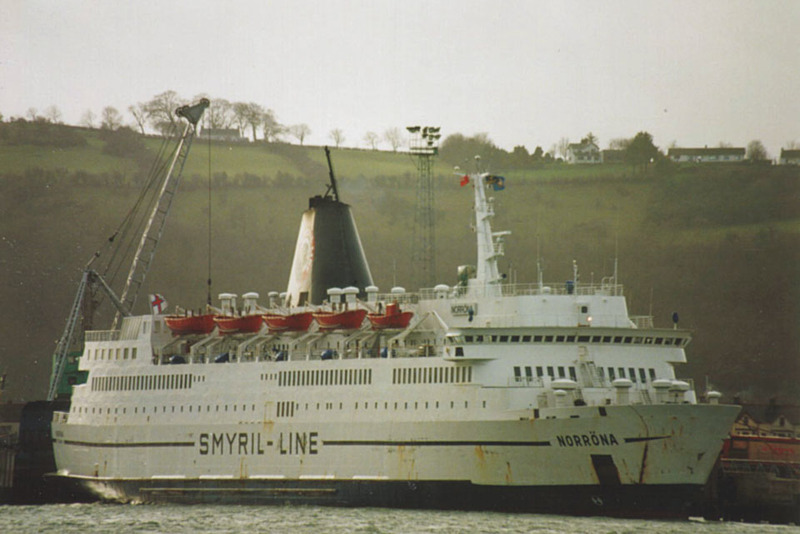 January 9th 1994 – January 25th 1994: Chartered to Sealink Stena Line for services between Fishguard – Rosslare. 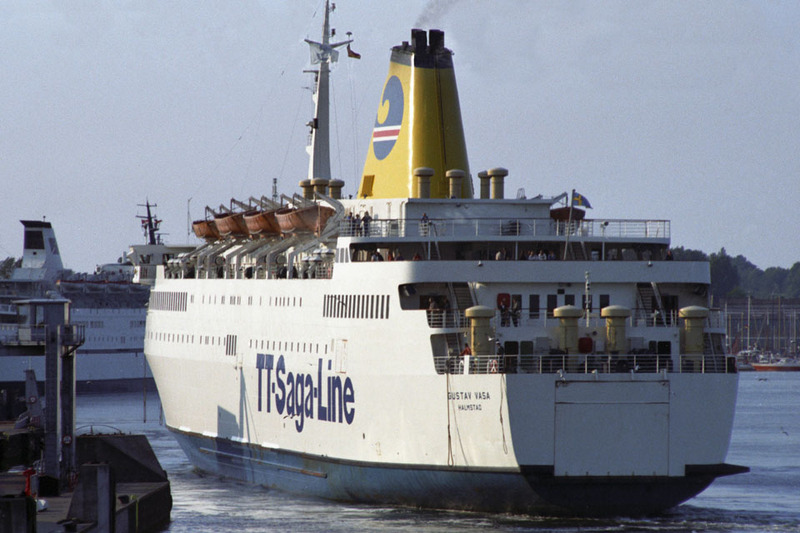 January 26th 1994 – March 28th 1994: Chartered to Sealink Stena Line for services between Holyhead – Dun Laoghaire. May 1994 – September 1994: Services between Seydisfjördur – Bergen – Torshavn – Esbjerg. 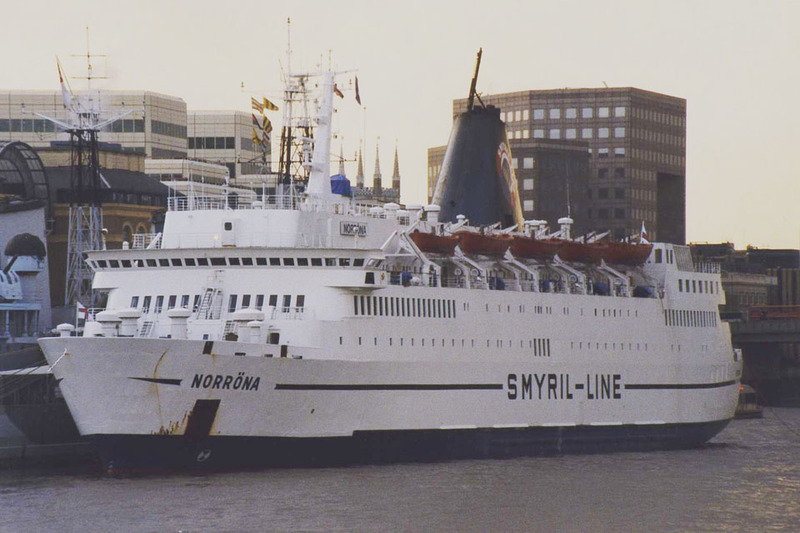 September 15th 1994 – November 4th 1994: Chartered to North Sea Baltic Ferries for services between Wismar – Newcastle under the banner “Wismar II”. November 4th 1994: Laid up in Copenhagen. 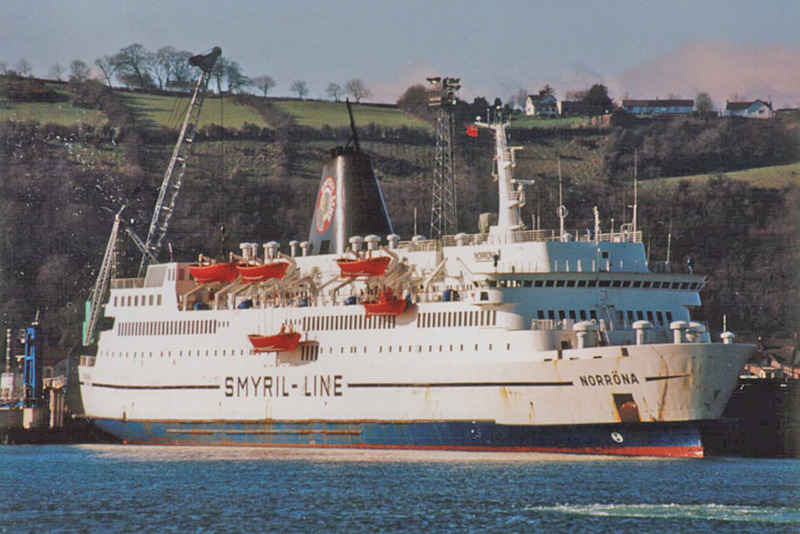 January 4th 1995 – March 1995: Chartered to Stena Sealink Ltd for services between Stranraer – Larne. May 1995- September 1995: Services between Seydisfjördur – Bergen – Torshavn – Esbjerg. September 1995 – May 1996: Laid up in Copenhagen. May 1996 – September 1996: Services between Seydisfjördur – Bergen – Torshavn – Esbjerg. September 1996 – April 1997: Laid up in Copenhagen. 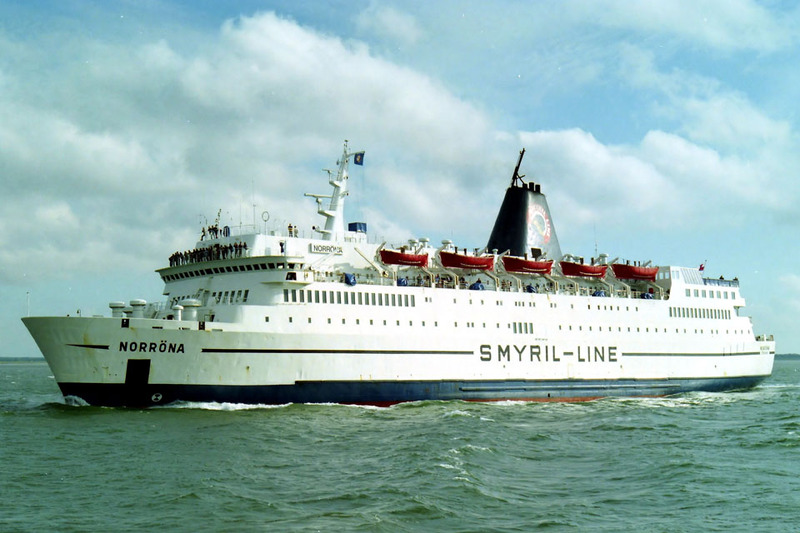 April 1997: Chartered Fjord Line for three weeks. Services between Hanstholm – Egersund – Bergen. May 1997 – September 1997: Services between Seydisfjördur – Bergen – Torshavn – Hanstholm. September 12th 1998 – May 14th 1999: Services between Hanstholm – Torshavn. 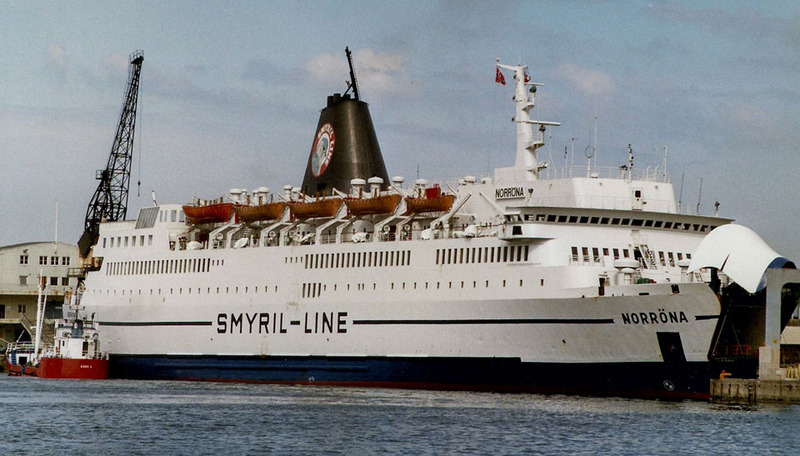 May 17th 1999 – September 8th 1999: Services between Seydisfjördur – Bergen – Torshavn – Lerwick – Hanstholm. September 1999 – May 2000: Services between Hanstholm – Torshavn. May 2000 – September 2000: Services between Seydisfjördur – Bergen – Torshavn – Lerwick – Hanstholm. 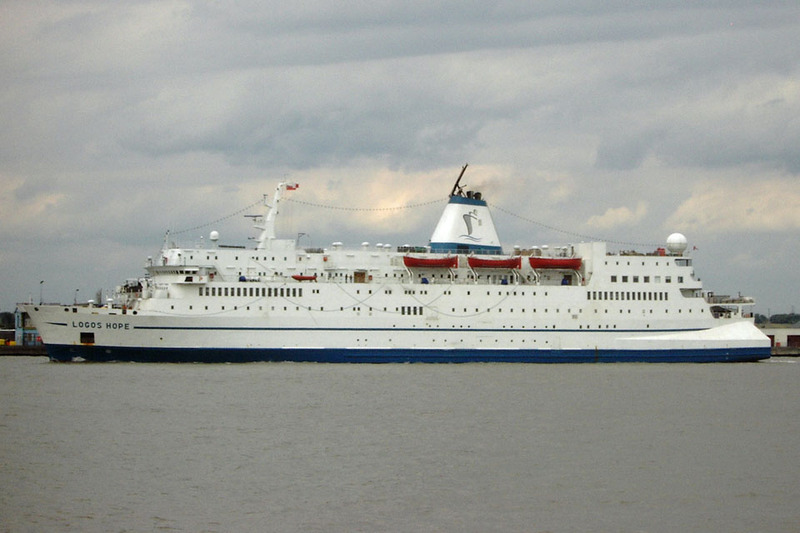 September 9th 2000 – October 2000: Rebuilt with stern sponsons at Fredericia Skibsværft A/S, Fredericia. 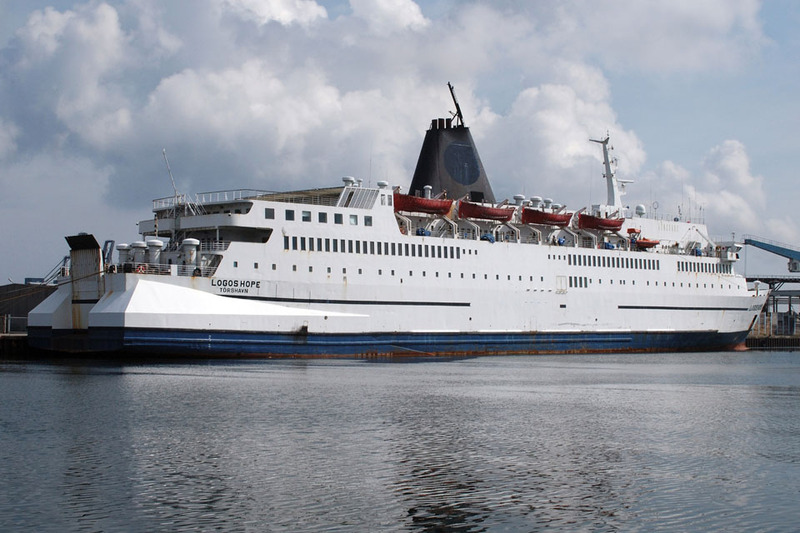 October 7th 2000 – May 18th 2001: Services between Hanstholm – Torshavn. 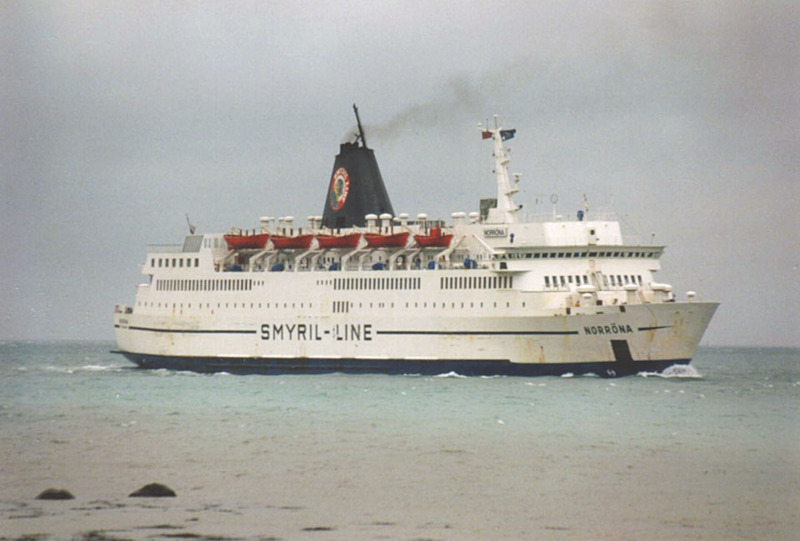 May 19th 2001 – September 2001: Services between Seydisfjördur – Bergen – Torshavn – Lerwick – Hanstholm. September 2001 – May 2002: Services between Hanstholm – Torshavn. May 2002 – September 2002: Services between Seydisfjördur – Bergen – Torshavn – Lerwick – Hanstholm. September 2002: Services between Hanstholm – Torshavn. 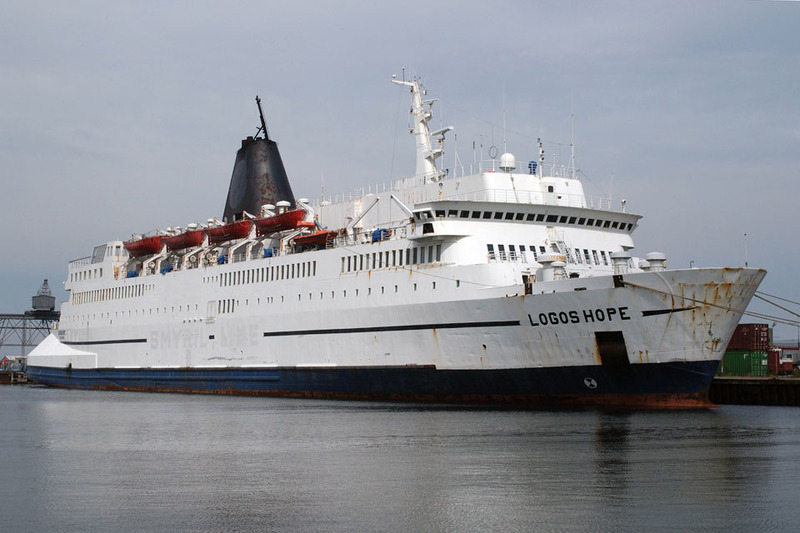 April 5th 2003: Renamed NORRONA I.
April 11th 2003: Final sailing, laid up in Esbjerg, and offered for sale. September 26th 2003: Left Esbjerg for Copenhagen. September 27th 2003: Laid up at Færgehavn Nord, Copenhagen. January 16th 2004: Left Copenhagen for Hanstholm. January 17th 2004: Commenced services between Hanstholm – Torshavn – Lerwick – Hanstholm. March 21st 2004: Laid up at Færgehavn Nord, Copenhagen. March 31st 2004: Sold to Operation Mobilisation Logos Ltd., Valletta, Malta. April 16th 2004: Transferred to her new owner. 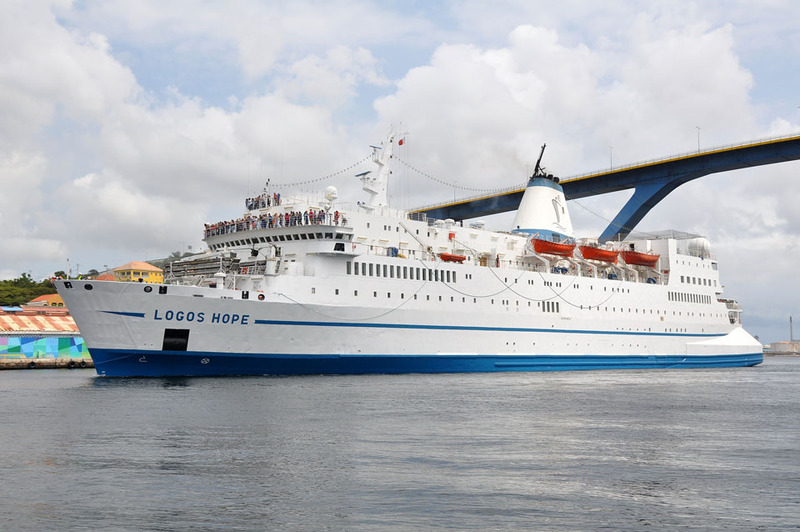 May 1st 2004: Renamed LOGOS HOPE. February 1st 2005: Left Copenhagen for Bijela-Shipyard, Montenegro. February 2005: Disputes with the shipyard over cost led to her arriving in Valletta, Malta. 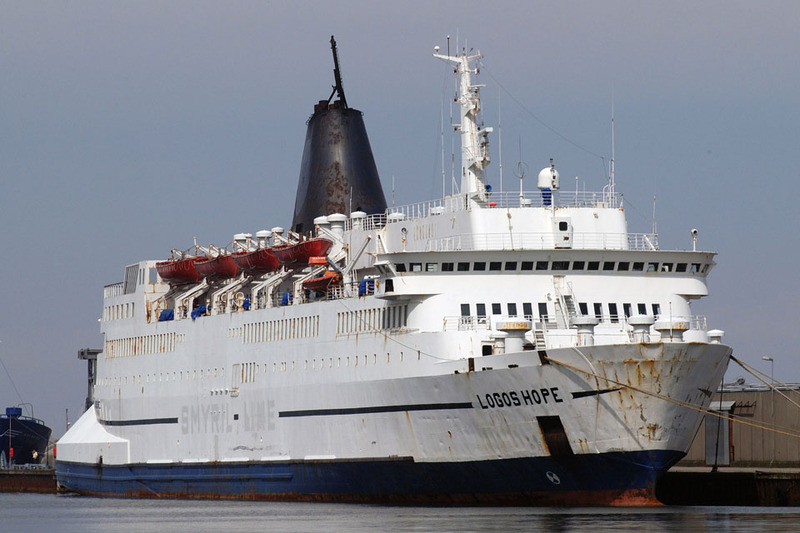 May 4th 2005: Moved from Valletta harbour to anchorage, where she was arrested. June 15th 2005: Arrived Trogir, Croatia for rebuilding. November 8th 2007: Left Trogir for Kiel. 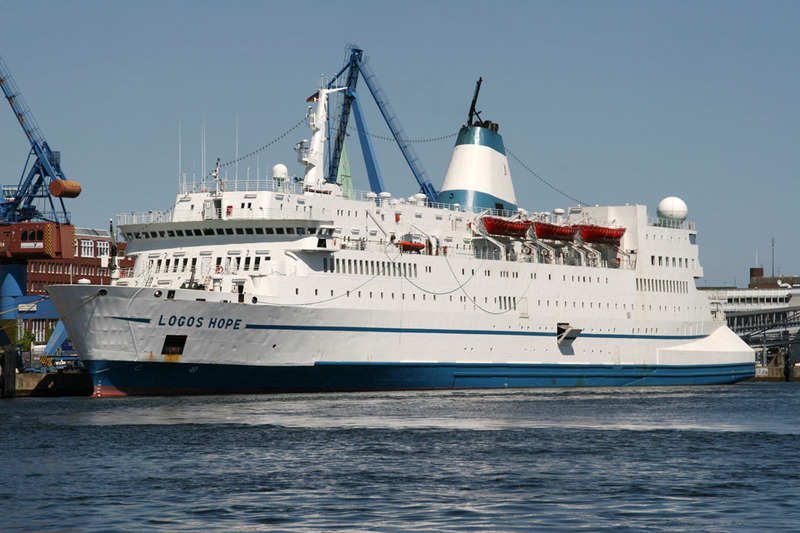 November 26th 2007: Arrived at Kiel, for further outfitting. May 29th 2008: Left Kiel for dry-docking at Öresundsvarvet, Landskrona. June 16th 2008: Left Landskrona for Køge, Danmark. February 19th 2009: Left Köge for Gothenburg. March 2012: Registered Owner, Doulos (Care of GBA Ships eV), Mosbach Germany. All information is believed to be correct and no responsibility is accepted for any errors or omissions. All items included in this article are subject to © copyright. We would like to take this opportunity of thanking: Cees Bustraan, Aubrey Dale, Frank Heine, Pieter Inpyn, Ken Lubi, Simonwp, Rober J Smith and Andreas Wörteler for their assistance in producing this feature. 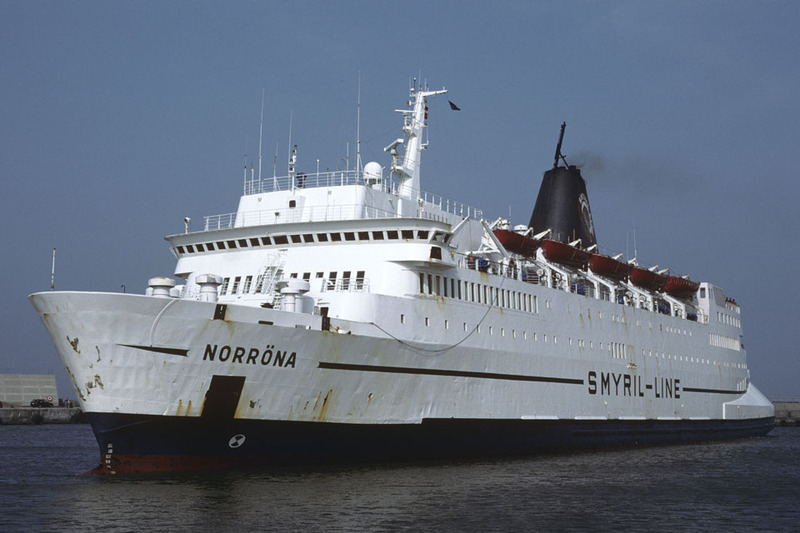 I enjoyed the pleasure of being pilot on the Norrona in 1995 when she was on charter to Stena Sealink on the Stranraer / Larne service for a few weeks, when my own ship Stena Caledonia was in dry dock. A lovely ship with a friendly “Viking” crew of Faroese.